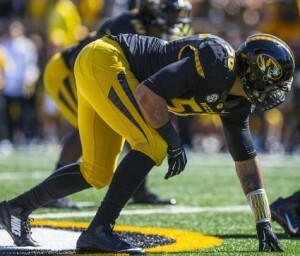 Just hours after being named a First Team All-American by both the American Football Coaches Association and The Sporting News, Mizzou junior DE Shane Ray (Kansas City, Mo.) was named a First Team All-American by the Football Writers Association of America (FWAA) on Wednesday afternoon (Dec. 17). The FWAA honor gives Ray First Team All-America distinction from four of the major five All-America teams. He was a consensus pick earlier this morning and is Mizzou’s second consensus All-America pick in as many seasons after Michael Sam was a unanimous pick a year ago. Ray is now the 13th Consensus All-American in program history and the fifth under the direction of head coach Gary Pinkel. The other Consensus First Team All-Americans are Martin Rucker (2007), Jeremy Maclin (2007, 08), Chase Coffman (2008), Michael Egnew (2010) and Sam (2013). Continuing a trend of quality play along the defensive line at Mizzou (#DLineZOU), Ray is the latest star pupil under Mizzou defensive line coach Craig Kuligowski. Under Kuligowski’s tutelage, Ray reset the school’s single season sack record with 14.0 this season while also totaling 21.0 tackles for loss. Both of those figures are the third-most nationally and lead the SEC. He is second in the SEC in tackles for loss per game and sixth nationally in tackles for loss per game. Ray also finished fifth on the team in total tackles with 61.